We’ve had a lot of interest in our avalanche program lately, so we thought we’d give you an inside look at what goes on there. Meet Avalanche Tech Robb Andersen. Robb’s been working in avalanche safety since 1994, and he’s been with the ministry since 2004, working the snowy slopes in different areas throughout the province. He was in Stewart working Bear Pass when they had their biggest winter in 30 years, and he’s also spent a lot of time in Kootenay Pass, which is where we caught up with him to ask some questions. What does a typical day look like for an avalanche tech on Kootenay Pass? We start our day at 7:00 a.m. The first thing we do is drive through the avalanche area, making observations and looking particularly for any changes overnight or any new avalanche activity. Past, present and future weather conditions are the most significant factor in regards to changing avalanche hazard levels. We visit our weather station after our initial road patrol, (which is located at the summit of Kootenay Pass). This is where we make current weather observations and readings as well as look at the general snowpack structure. Some of the key snowpack questions we answer are: How is the new snow bonding to the old snow surface and are there any significant changes in the snowpack (is it getting stronger or weaker)? Then we call our weather forecaster and get a synopsis for the next one to five days. Because weather is such a significant driver of the avalanche hazard, we base a lot of our operational planning and decisions based on the weather forecast. As you can appreciate, we need to be very flexible and adaptable because… well the weather forecast is always changing. 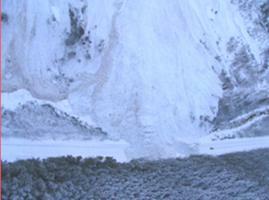 What is the avalanche hazard? Are conditions improving or getting worse? If the avalanche hazard is on the rise and avalanche control looks inevitable, then plans need to be made to carry out avalanche control at some point. If the avalanche hazard is low, then we try and get into the mountains where we can to make snowpack structure observations closer to the avalanche starting zones. What’s the biggest avalanche you’ve ever set off? 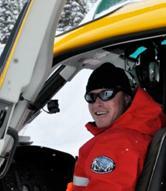 Winter of 2006-2007 when I was working with the Bear Pass avalanche crew in Stewart B.C. During a helicopter bombing mission we set off a size 4.5 (really big) avalanche in an avalanche path called Canyon. This avalanche path runs over 6000 vertical feet from start zone to highway with a total length of 3.5 km. It was only the second time in recorded history that this avalanche path had affected the highway. The avalanche deposit was up to 16 metres (50 feet) deep on the road and took 4 days to clean up. What was your busiest year? Last winter at Kootenay Pass (2010-2011). 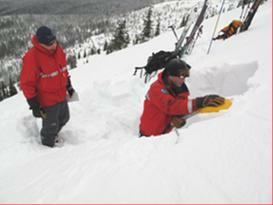 It was my first winter managing the avalanche program at Kootenay Pass. The rest of my staff (four people) were all new to their positions as well. We received the second highest snowfall total at Kootenay Pass in over 35 years of record keeping. On average, between December 1 and April 31 we had to perform avalanche control every 2.5 days. Every avalanche control mission put avalanches on the highway. It was a winter to remember. I may not see another like it in my career as it was a record breaker. What do conditions have to be like before you close the highway? See that dot to the right of the avalanche? That’s a truck. What happens during closures and how do we know when it is safe to re-open the highway? Once we close the highway for a high-avalanche hazard, an assessment is made by the avalanche technician. Typically we will attempt to create avalanches with an explosive device in the starting zone of the avalanche path of concern. This will de-stabilize the snow and start a controlled avalanche. Generally once avalanche control has been completed the maintenance contractor will then be allowed into the avalanche area to start deposit removal. The highway is then re-opened once the avalanche deposits have been cleaned up and the highway has been ploughed and sanded. It’s one of the more intriguing parts of the ministry’s business, and we could have easily kept asking Robb more questions. But we can’t keep him in the office all day. He’s got to head out to the slopes and check how it’s doing after the latest snowfall. He could be closing the road and starting another avalanche soon. Are there other questions you like to ask our avalanche techs? Connect with us on Twitter or Facebook, send us your question, and we’ll try to get it answered for you. I am looking to move from the Construction industry to a new career,I am 48 years old and am in good physical shape.I am wondering if there are any openings in this field and if so what I would need to be considered for employment?